Do you have a hobby that has rudely taken over your house and dampened your enthusiasm for that particular pastime? All the “stuff” I needed to take pictures for this little blog had slowly gotten out of control. It was so bad, I found myself wanting to quit blogging altogether and open an Etsy shop just to get rid of the clutter. Then, the very object I had resisted for the last few years came to my rescue. This hutch belonged to my Aunt Julia and has to be at least 60+ years old. My mom claims it is cherry wood and it was one of her most prized possessions. I can’t count the number of times she asked me if I wanted it but I always said it was too big and I didn’t have room. Secretly, I wasn’t even sure I liked it. So recently, when my mom was moving out of her 2-bedroom apartment into an assisted-living type of efficiency (one room and a bath), it had to go. To please my mother, I finally said I would take it. I got the idea to give away a piece of furniture in my sun room where I do most of my food photography and moved the hutch into the vacated space. It still had the original finish which was actually part of my resistance initially. My mom mentioned it needed refinishing so I decided to go even further and have it painted and distressed to fit into my decor. I love the detail on the handles and the rope edges of the cabinet. I called my friend and artist extraordinaire, Scott Dykema (check out his Etsy shop here). 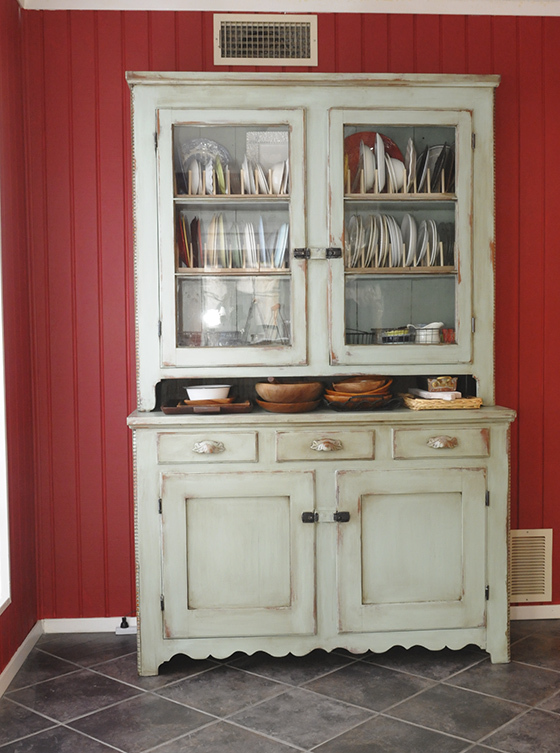 He had painted some cabinets for us in the past and I knew his creative touch would bring the hutch back to life. He helped me pick just the right color and then I left the rest in his hands. It turned out to be the perfect place for storing food props. I had been using open shelves to hold my stuff but they were too messy for my taste. And anyway, they weren’t quite big enough to hold my burgeoning collection of plates, silverware, trays, vintage bottles, racks, etc. My hobby had clearly gotten out of hand. I’ve broken more than one dish with my previous stack ’em-high routine. When I saw the way Lorraine of With a Grateful Prayer and a Thankful Heart stored plates in her garage, I bought plate holders from the Container Store. Paula at Still Life Style wrote about a similar idea here. Arranging plates this way should make it easier to see what I’ve got to choose from when plating food. Unlike my kitchen, I'm leaving the doors on these cabinets. 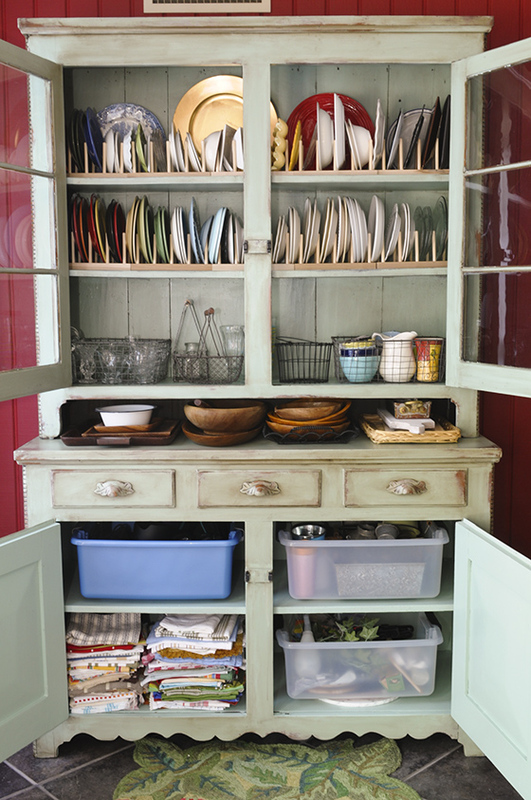 The drawers are ideal for storing silverware and utensils. The plastic tubs hold camera equipment, vintage cookware and odd props. I also like the way the linens are stacked so it’s easy to view what I have instead of layered in a drawer where I can never quite see what’s at the bottom. With everything organized and together in one place, I feel a new excitement about taking pictures of my latest recipes. I now have more space in my sun room to move around and I can find things quickly. Maybe I WILL keep blogging a little while longer after all. Thanks Mom! I love my new hutch. I will treasure and use it for many years to come. P.S. My dad installed lights inside of the upper cabinets which still work. Don’t know how much I’ll use them but they are rather charming and remind me of my dad and the way he liked to fix things up to please my mom. This is fantastic! I just pinned this. I love the idea. I’m going to keep my eyes open for a similar pieces of furniture to convert. Thank you!! The hutch looks pretty (mainly because of the mint+red combination) but I loved the original wooden style of it, it looked warm and classic. It’s been a while since I read your blog, please don’t stop posting… i’m learning so many new recipes from another culture that is commonly steriotyped here in South America. Hi Cari, The wooden style was OK but really did not look good in my red room. Just disappeared. Glad you dropped by. Paula, I love the hutch! You inspire me to get organized myself. I have my mothers old sewing hutch and that I really should make over. It still has the old sewing machine in it and I dont even sew. Paula, it looks absolutely great! You were so smart to have Scott do the painting, that would have been a monster to tackle. Love the organization, make sure you glue those plate racks together with wood glue, if they are the kind that sort of peg together. As the wood dries and shrinks they tend to collapse and your plates go down like dominos…heaven forbid! Thanks for the tip Paula. The plate racks came glued together. Didn’t know I could buy ready-to-assemble which I’m sure would have been cheaper. Did you notice the wooden bowls? I got those from my mother’s kitchen and intend to paint them per the instructions on your blog. The hutch is gorgeous and so very functional for you! I just got a new buffet to house all my cooking decorating supplies. I really like it but it certainly does not have the history nor character that this lovely piece of your has. Great makeover. Thanks Paula, Doesn’t it feel good to be organized? You’re not only a fabulous cook, but an amazing decorator as well- I am very impressed with what you’ve done with the cabinet!!! Love your blog….love the refinished piece. Thanks Karen. Glad you’re back. How lovely that you were able to use a piece of furniture that meant so much to your Mom. Your refinisher did a beautiful job – I would not have noticed the rope edges or the handles on the drawers pre-distressing. Are the handles wood? Sorry it took so long for me to answer. Yes, the handles are wood. Aren’t they cool? The object you are asking about is a marble cheese plate. Thought it would be a cool texture in my pictures but haven’t used it much. Not really big enough. I think I’m most excited about the way the plates are stored because I will no longer have to unstack and restack. Always seem to want the plate at the bottom. I love everything about this piece: the size, the color, and your staging! Great job! Wow what a great transformation! It turned out beautifully! what a nice finish! …i could do that with my grandmother hutch… 😉 great job! What beautiful photos. 🙂 Great job with the cabinet–it looks wonderful! It’s beautiful and Anthropologie-ish. : ) I like the fact that the inside of the lower cabinet was painted, too. I’ve seen a lot of outside-only makeovers in blogland. I so need a hutch like this for all my food props. 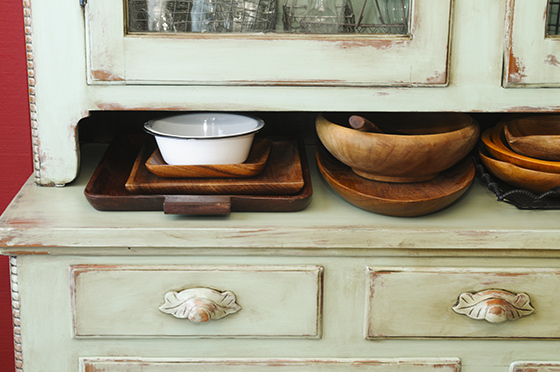 What a great idea of refinishing and distressing it to fit your style. Nice job! 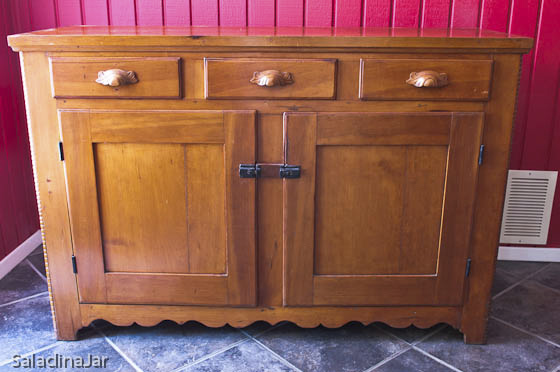 What a fantastic job you’ve done re-purposing this hutch! And years from now you’ll be glad you have it because it will remind you of your mom. I love what you did with this old pc of furniture. If I had more room or a place to put it I would have to try this same thing. Some people would say you did this to cherry wood? But I say you really gave it character. Love, love it. What a fun way to organize and store your blog props. Fantastic…this was so much fun to see and hear about…what a wonderful idea and you have everything so nicely organized. Thanks for sharing, such fun for us! Oh Paula it’s gorgeous! I love the new color I have that color all over my house:). I know what you mean by all the things taking over. I want to find a gem like that too. Excellent job re purposing and reusing! Love what you did with it. I love it! If you ever get sick of seeing the dishes, you could install chicken wire with fabric behind it. I LOVE this look and am on the look-out for a cabinet just like yours to do this to. Just google (cabinet redo chicken wire) and you’ll see a ton of beautifully done pieces. Had not given this a thought Michelle so I immediately googled. Interesting and I might try it sometime–especially if the glass should break. For now, I love the look of the old glass but will keep this in mind. First of all, I would be so disappointed if you stopped blogging! 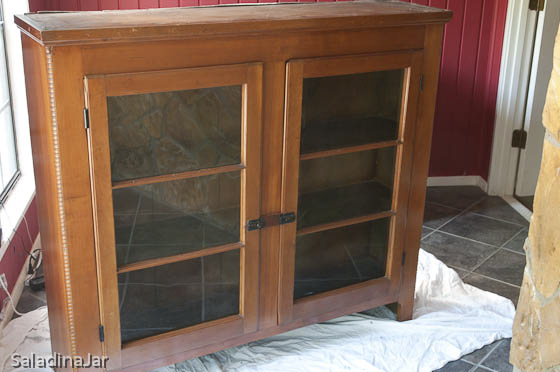 The hutch turned out beautifully…. I am super jealous of your decorating/organizing talent and taste! BTW, Ellie uses one of Aunt Julia’s twin beds that mom refinished… so cool!!!!! Great way to turn an “unwanted” piece of furniture into something very practical and fits right in with your home’s dècor. It’s perfect!